Cody Willoughby | AIM Media Northern Miami Valley Ohio American Red Cross board members Karon Wolfe and Paul Liddell examine the new Emergency Response Vehicle during its official unveiling at the NVMO Chapter on Monday in Troy. Cody Willoughby | AIM Media Northern Miami Valley Ohio American Red Cross volunteer Ray Smith serves ice cream to volunteer John Gross out of the new Emergency Response Vehicle during its official unveiling at the NVMO Chapter on Monday in Troy. TROY — A brand-new, state-of-the-art Emergency Response Vehicle (ERV) has been stationed at the Northern Miami Valley Ohio Chapter of the American Red Cross. 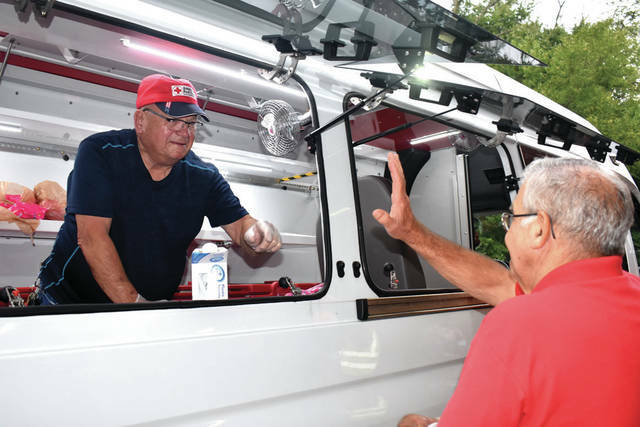 The vehicle was unveiled during a quarterly volunteer meeting at the Red Cross NVMO Chapter on Monday evening, which included a grill-out and ice cream service out of the ERV itself. The fully-equipped Mercedes Sprinter is part of the National American Red Cross fleet, and will serve the Northern Miami Valley, including Miami, Champaign, Clark, Darke, Logan, and Shelby County, in provision of food services and bulk distribution of disaster relief supplies during emergencies. It will also be kept in a state of readiness for national deployment when needed. According to Red Cross Executive Director Lynne Gump, the ERV came as part of an ongoing effort to update the fleet across the country. “We call these our Next Generation ERVs, because we’re trying to retire out our old fleet,” Gump said. “When vehicles are here longer than your volunteers, and you send them down south six times a year on a good year, they get a lot of miles on them by a lot of different drivers on a lot of roads that shouldn’t be driven post-hurricane. The ERV was donated by the Harold C. Schott Foundation of Cincinnati, along with two others to the Cincinnati and Portsmouth areas. Each of the three ERVs, including all provided gear, totaled approximately $100,000 each. The ERV is retrofitted with full cargo storage for food, water, clothing, disaster relief supplies, and features a serving window to facilitate catering services. “This vehicle allows us to provide even better service for the residents of the Northern Miami Valley affected by disaster,” Gump said. “With full lighting inside and out, heating, air conditioning, and comfortable seating, we can assist families out in the field safely and efficiently. The NVMO chapter currently boasts nine volunteers qualified to drive the vehicle, including several who work on the national deployment team, but Gump insisted that more volunteers are welcome. “We always need volunteers for this, and all the other work that we do,” Gump said. The new ERV will be embarking on its first national deployment run to South Carolina this week, in preparation for relief against Hurricane Florence. For more information, visit www.redcross.org, or find Northern Miami Valley American Red Cross on Facebook. https://www.dailycall.com/wp-content/uploads/sites/30/2018/09/web1_RedCross1.jpgCody Willoughby | AIM Media Northern Miami Valley Ohio American Red Cross board members Karon Wolfe and Paul Liddell examine the new Emergency Response Vehicle during its official unveiling at the NVMO Chapter on Monday in Troy. 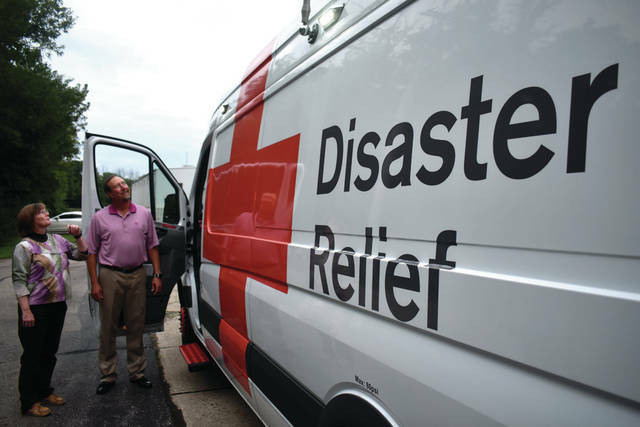 https://www.dailycall.com/wp-content/uploads/sites/30/2018/09/web1_RedCross2.jpgCody Willoughby | AIM Media Northern Miami Valley Ohio American Red Cross volunteer Ray Smith serves ice cream to volunteer John Gross out of the new Emergency Response Vehicle during its official unveiling at the NVMO Chapter on Monday in Troy.